Background: The actinomycetes strains isolated from unexplored ecosystems are a promising alternative for the biosynthesis of novel antimicrobial compounds. Depending on the interesting antifungal activity of the studied strain S19, the statistical method seems to be an effective tool for optimizing the production of anticandidal molecules. 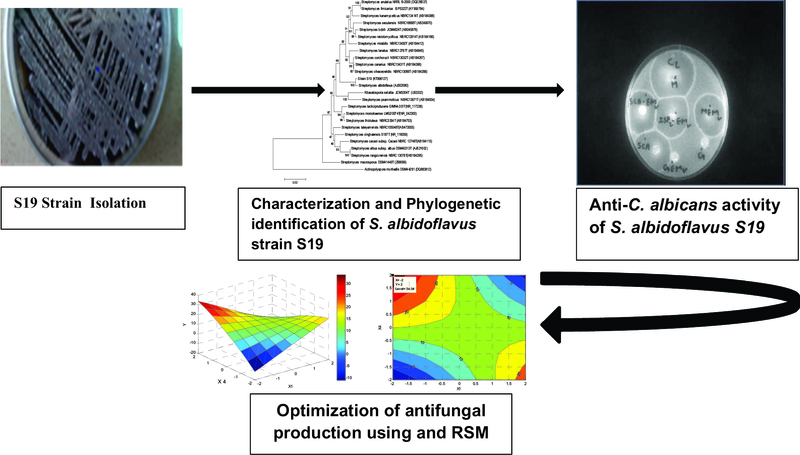 Introduction: This study was conducted in order to optimize the culture parameters (medium nutrients concentrations and initial pH value) affecting the production of antifungal metabolites from S. albidoflavus strain S19 (obtained from wastewater collected in Bejaia region, Algeria) using Response Surface Methodology (RSM). The best conditions for anti-Candida albicans compounds biosynthesis were determined. Methods and Results: The antimicrobial producer strain S. albidoflavus S19 was identified on the basis of morphological, chemicals characters and physiological characteristics along with 16S rRNA gene sequencing analysis. Response Surface Methodology by Central Composite Design (CCD) was employed to improve the anti- C. albicans agents production through the optimization of medium parameters. The highest antifungal activity was obtained by using a mixture of 2g l-1 starch, 4g l-1 yeast extract, 2g l-1 peptone at pH 11. Conclusion: The strain S19 isolated from wastewater showed a significant anti-C. albicans activity and this study revealed the effectiveness of RSM and CCD for increasing bioactive compounds production, rising the diameter of inhibition zones from 13 to 34 mm. Keywords: Streptomyces albidoflavus, central composite design, RSM, optimization, antifungal production, antimicrobial activity, Candida albicans. Keywords:Streptomyces albidoflavus, central composite design, RSM, optimization, antifungal production, antimicrobial activity, Candida albicans. Abstract:Background: The actinomycetes strains isolated from unexplored ecosystems are a promising alternative for the biosynthesis of novel antimicrobial compounds. Depending on the interesting antifungal activity of the studied strain S19, the statistical method seems to be an effective tool for optimizing the production of anticandidal molecules.